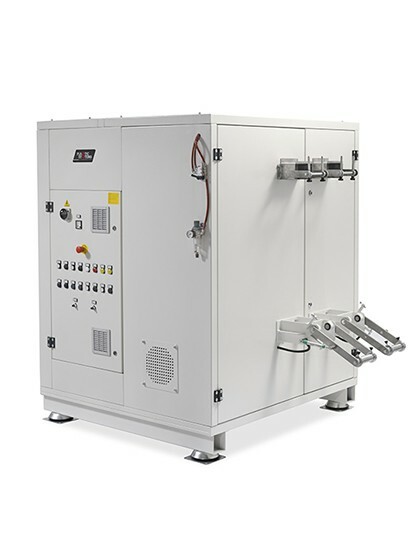 The granulator model GR2845-2T has been studied for an in-line use on PP-PET sheet extrusion systems. 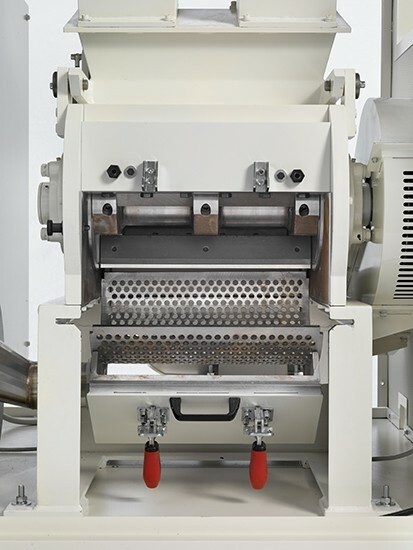 The granulator allows recovering side scraps side of the extruded sheet. The speed control of the 2 haul-off units with inverter allows a synchronized operation with the extrusion line, preventing the break of the scraps. The cutting chamber with a 3-moving 2-fixed blades, solid construction, allows grinding material with a minimum thickness of 100 microns up to a maximum of 2000 microns. The machine equipped with a fan allows an immediate recovery of the ground material. • High-quality cutting chamber with side rotating disks. • Quality steel open, self-ventilated rotor. • 2 adjustable fixed blades. • 3 adjustable rotating blades, with adjusting template. • Selection grill with a wide dischage surface. • Regrind-collecting container, with fan as option. • N°2 haul-off units with a width of 170mm, indipendent, controlled by a fan-assisted gearmotor and speed control by inverter; nip roller controlled by a pneumatic bi-piston. • N°2 arms with linear potentiometer to automatically adjust the speed. • Electrical switchboard with automatic-regulation system of the feeding speed. Low noise level thanks to its efficient sound-proofing. Easy access for an easy maintenance. It follows the production of the extruder.